Produced in cooperation with 'The Tract House,' a project by Lisa Anne Auerbach. 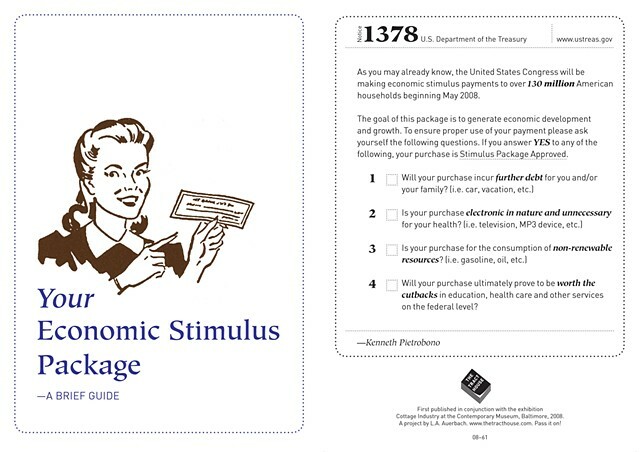 As you may already know, the United States Congress will be making economic stimulus payments to over 130 million American households beginning May 2008. The goal of this package is to generate economic development and growth. To ensure proper use of your payment please ask yourself the following questions. If you answer YES to any of the following, your purchase is Stimulus Package Approved. 4. Will your purchase ultimately prove to be worth the cutbacks in education, health care and other services on the federal level?